As christening keepsakes, these cross design christening boxes are sure to find a special place on your guests’ dressers or coffee tables once they take them home. Our cross design curio boxes are fitting for just about any occasion. Also purchased as baptism boxes favors, each measures 3" x 3" x 1" and is made of sturdy poly resin, a form of plastic, in a silver/pewter finish. 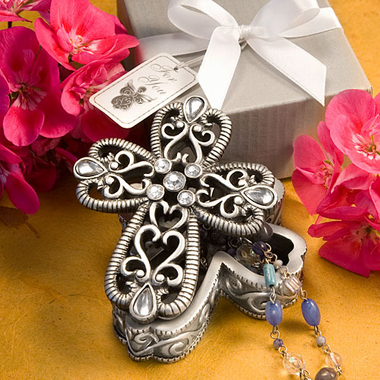 Designed to hold any number of treasures, each cross shaped box has a solid filigree base with a removable cover that has a detailed cross design with filigree swirls and assorted shaped rhinestone enhancements for a shimmering touch. Sure to make a stunning presentation, each comes in a satin finish silver box, tied with a white satin bow and an attached angel themed “For You" tag. You may also purchase personalized hang tags or stickers for this item for an additional $.35. If you select the hang tags they come pre-punched with a round hole and include a 5" long white elastic string (not attached). You have your choice of tag/sticker shape - Diamond (1.75" x 1.75") or Round (1.75" diameter), background color and design.